Like all Angelenos, my morning started off with a pre-dawn 4.4 earthquake, which literally jolted me out of bed. Though I've lived in LA for years, I am still not accustomed to the earth moving under my feet--and don't think I will ever be! I did my best to conceal my rattled nerves from my kids, who had never experienced an earthquake before. My youngest son (age 5) thought a strong gust of wind shook the house. Meanwhile my seven-year-old son's friend, who lives across the street, believed the trembling was due to a giant leprechaun emerging from his closet for St. Patrick's Day! He was distraught to say the least! Fortunately, in the end, nothing broke and no one got hurt... that is until my husband called me several hours later from Santa Barbara, 120 miles from home, where he had not been "quaking" but rather surfing. From the emergency room, he reported that he had dislocated his shoulder, then assured me that he was "fine" and "not to worry!" Needless to say, it's been one of those days! The only good thing that has gone right: the arrival of these stunning Givenchy sandals on my doorstep this afternoon. I am looking forward to wearing these beauts in less anxious times! P.S. 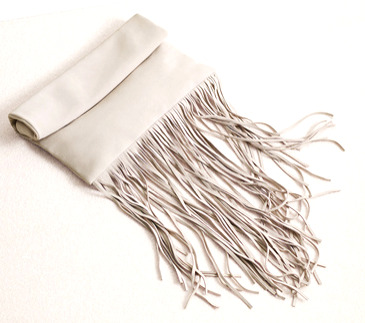 I also eked out a happy grin when I discovered this killer $99 H&M fringe suede clutch a few minutes ago. What a find!